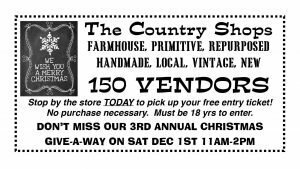 Shop Small is on the Saturday after Thanksgiving and is dedicated to getting people to get out and shop at their local small businesses. When we shop locally help our community, our local merchants and ourselves. Our small businesses are asked many times to help sponsor local events, give merchandise as gifts for auctions and drawings and cash donations for benefits. If we support our local merchants they will be able to continue to do business in our community and help when asked with donations. 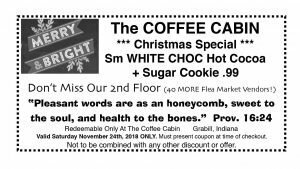 So remember Shop Small on Saturday November 24th in Grabill. 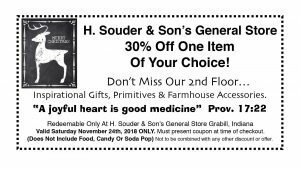 Check out the ad in this week’s Courier for details on local businesses and use the coupons below for additional savings.